Global Skills, Agile Thinking, Digital Business Skills and Relationship Building - These are the four emerging skill sets required to stay relevant in the Age of Disruption, where uncertainty, ambiguity and unpredictability are the new business norms. In today’s age of technology-driven disruption, reinventing yourself has become a necessity to stay relevant. 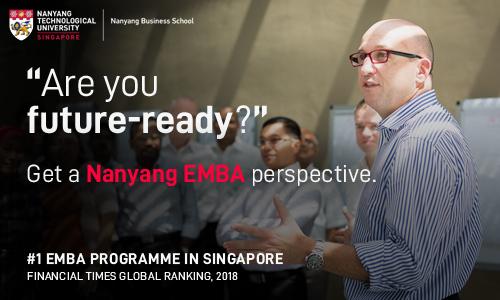 The Nanyang Executive MBA (EMBA) programme is designed to develop the precise skills needed to thrive in a disruptive age. Hear from Prof Guido Gianasso, a leading expert in human resources and global leadership, on how the Nanyang EMBA can equip you with these emerging skills to stay relevant in a world of constant change. Professor Guido Gianasso is a leading global leadership and HR expert and has 30 years of management and teaching experience in education, aviation and banking as well as with international governmental organisations such as United Nations and World Bank. In addition to his role at NBS, he consults with leading MNCs and speaks at international conferences in Asia and Europe. He is also Visiting Professor at the University of Geneva and Honorary Consul of Romania in Switzerland.